At the request of 26th IDFA Cambodian director Rithy Panh (1964, Phnom Penh) compiled his personal Top 10 of documentary films. The films of his Top 10 are screened during the festival, accompanied by a Retrospective of the filmmaker`s own work. In his Top 10 Rithy Panh selected two films of Joris Ivens/ Marceline Loridan-Ivens, which will be screened on Sunday 24th and Monday 25th at EYE and Tuschinski. Rithy Panh is well known for his documentaries about the Killing Fields of Cambodia, which he experienced himself. His family members were expelled from Phnom Penh in 1975 by the Khmer Rouge. One after another, his father, mother, sisters and nephews died of starvation or exhaustion, as they were held in a remote labor camp in rural Cambodia. His film The Land of the Wandering Souls (La terre des âmes errantes, 2000) shows a kind of road movie along the route where Alcatel commissioned to lay the country’s first optical fiber cable. The film follows a Cambodian workers family as they are digging the trenches across Cambodia for this cable, depicting their poverty, hardships and lousy working conditions. At one point during their excavation, the workers uncover a killing field, a remnant of the genocidal purges of the Khmer Rouge. Rithy Panh made his breakthrough in 2003 with S21, The Khmer Rouge Killing Machine. His latest film, The Missing Picture, was the winner at the 2013 Cannes ‘Un Certain Regard’. 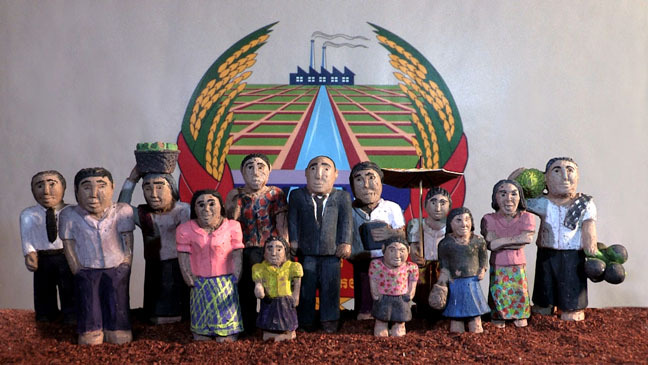 Panh`s story of his family`s nightmarish experience during the Pol Pot regime in Cambodia during the 1970s is expressively told through first-person narration but acted through clay figures. Rithy Panh selected two films of Ivens/Loridan-Ivens: The Football Incident (l’Histoire d’un ballon, 1976) and A Tale of the Wind (Une histoire de vent, 1988). He is very much in favour of committed filmmaking in which the director on the one hand is deeply involved in his subject matter on a very human level and in on the other hand makes it clear that no objective truth is being presented. On the contrary: fiction and reality play a continuous game about what is true or false. To his opinion his films always show a false mirror of reality.